My family and I are presently vacationing in Spain. We are having a wonderful time here. Holidays means pictures – digital ones – and a lot of them. 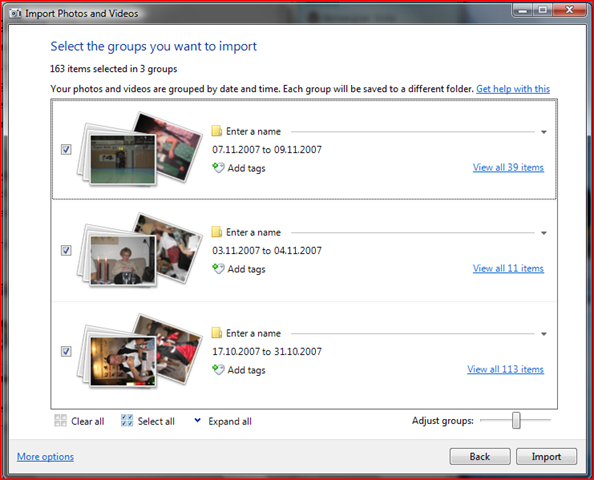 Since installing Vista I have been using Photo Gallery to import/sort and maintain my photo-collection. I have been very satisfied with almost every aspect of the program, the import feature being the one that I have been the least pleased with. I installed the Windows live Photogallery some days ago, but only yesterday appreciated the improved import feature. Microsoft actually listens to its customers; the new interface is everything the old one should have been. After naming/tagging the pictures the way you want, Windows Photo Gallery then imports the pictures. Easy as 1-2-3, and the result is just the way you wanted it. Brilliant! Too bad they didn’t get it like this with the release of Vista. Better late than never.